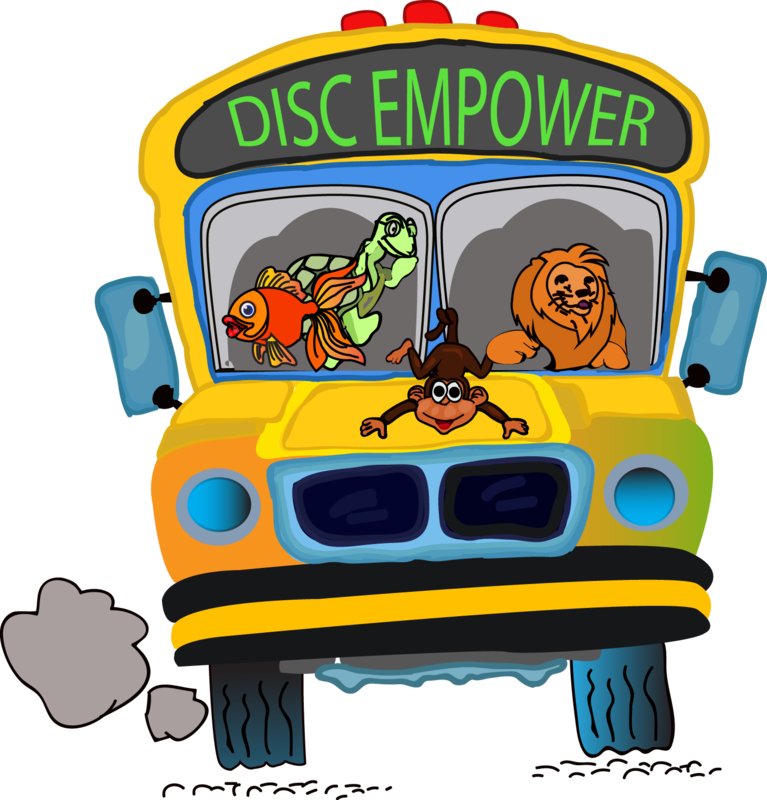 DISC Empower has been written, developed and published in Australia! 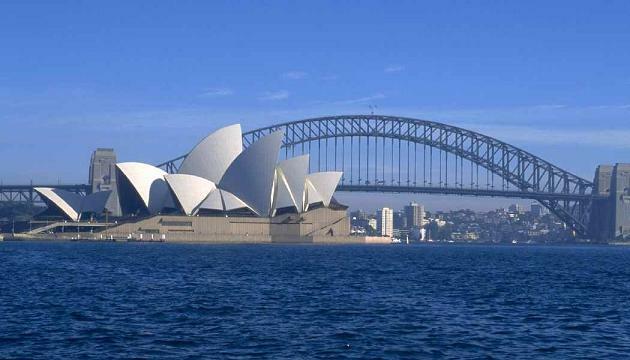 With it’s head office in Sydney, Australia, DISC Empower is the only Behavioural Profiling and Professional Development system developed with the primary purpose of executive coaching and staff development in mind. 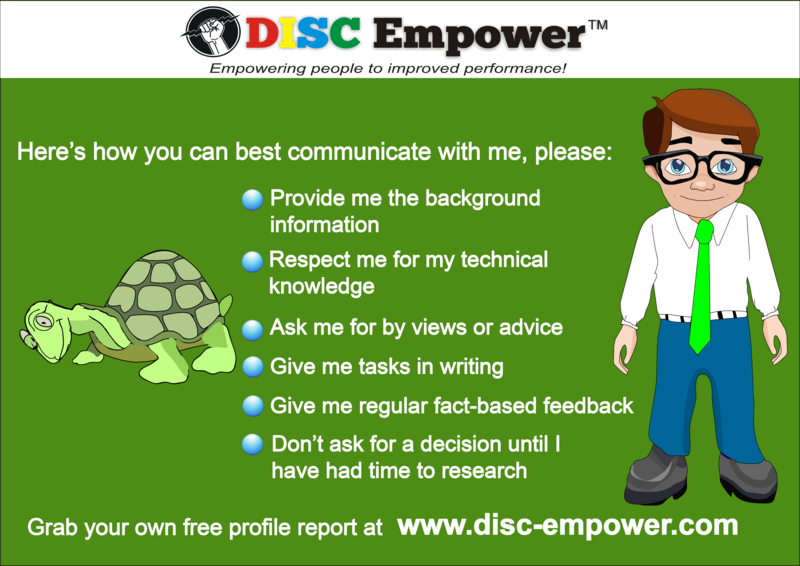 Many people who have taken advantage of the DISC Empower system have told us that it has helped them greatly in their career development. 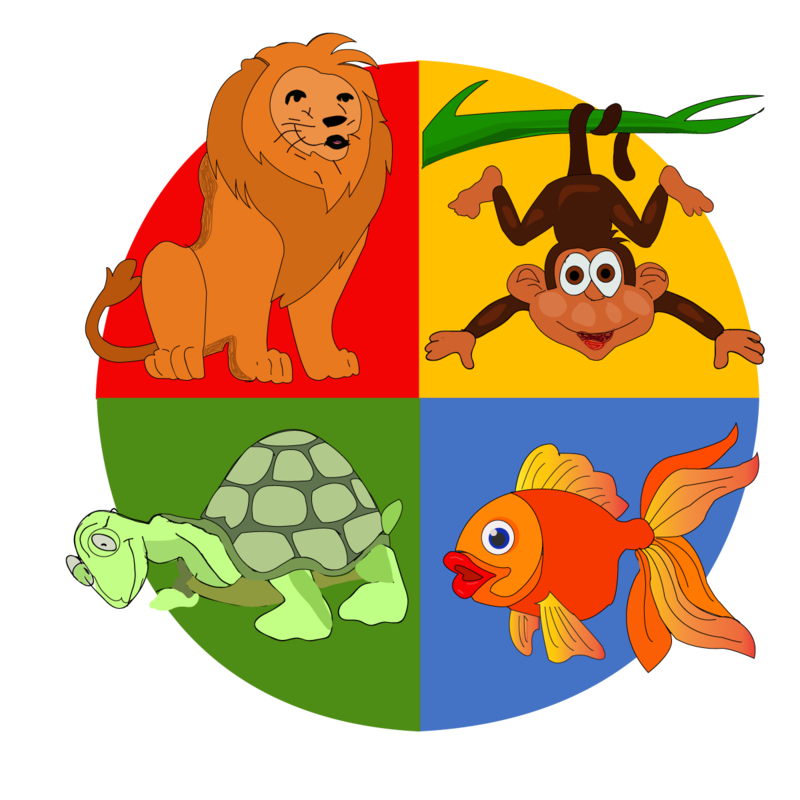 This is the home-page of CLYDE the Turtle. Good morning, and welcome to my home-page. 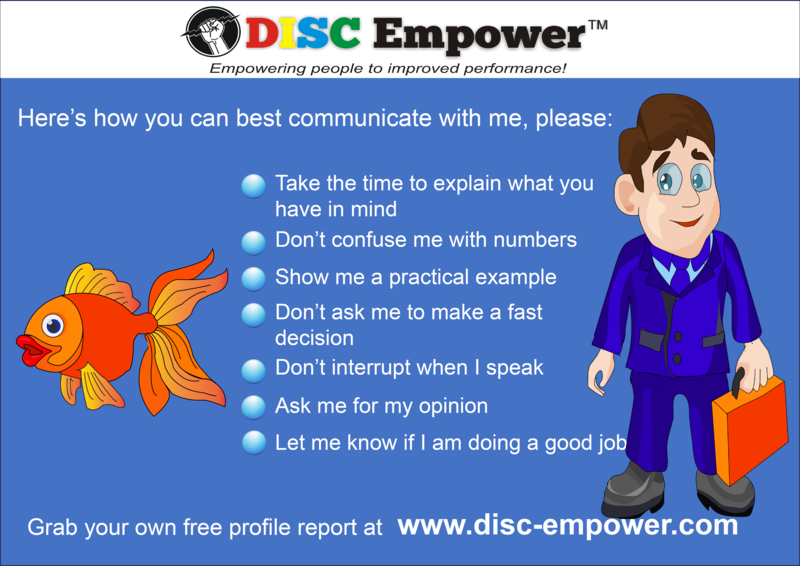 As part of becoming a professional in my chosen area of expertise, someone who’s advice I trust advised me to become an authority on DISC Empower behavioural profiling. 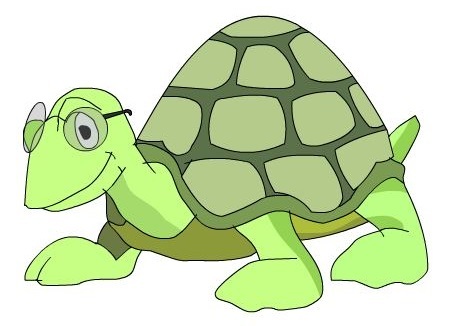 So that I can help other Turtles (that is, other animals and people who have a somewhat similar behavioural style to me), I am currently studying, and will report back ASAP with the details YOU need to become better in your role. This information will improve your results, but it has to be accurate. PS: I have done the research and can confirm that I am a High C.
Lions hate you wasting their time. I often have to help Dominic as he tends to be “rip-tear-bust” leaving a trail of destruction in his path. Don’t be offended if a Lion says something to you very abruptly. I find dealing with Dominic it helps if I start with the big picture, and only go into the detail if he asks for it. Monkeys drive me nuts. Talk-talk-talk! Plus they don’t put the time into research and study to become an authority on anything! However, they ARE better with people, and tend to help our team overcome conflict, and our customers love them. One thing that I find helpful when dealing with Monkeys is to be prepared to be more open, and not always point out their failures. I am putting together a whitepaper on working with Monkeys, and will share it with you once it is finished. Goldfish enjoy working with people, so we get on just fine. I have trained Sammy not to interupt me when I am busy, and this really helps, too. Sometimes we just have to be careful we don’t waste too much time socialising, as that is what we do best. Oh, and there was some work to do?! OK, I remember now…!!! This is the home-page of SAMMY the Goldfish. I just want to say hello, and welcome you to my home-page. I hope you like it! What would you like to see added to it? I set this page up to help other Goldfish, who just like me always appreciate tips on how we can perform at our peak at work, so everyone achieves more and as a team we achieve our goals. We love the security that an unchanging workplace gives us…but sometimes we need to step out and explore new ways of doing things! Don’t get up against someone that gives you a nudge towards new ideas. Don’t be a YES person. One of our bad habits is trying to please EVERYONE. So we keep saying YES to everything we are asked to do, until we have no time to swim or eat or exercise; our health and wellbeing suffers, and next thing even those that we really care about are let down. Be gutsy enough to say NO sometimes. Do you want another workplace tip: hustle more. Always walk like you are 5 minutes late. This sends a message to others that you understand that “time = money”. Someone that wanders around sends the wrong message to others in the business. Also, remember to use your initiative! Don’t always hold back to see what others do. Be prepared to be a leader. Now, what about when things go wrong? Don’t worry, it will blow over. Just don’t go into your cave. Be prepared to quietly talk it over with someone else. Pick up the phone and give them a call; it’s a great stress release. Sometimes busy people don’t run around thanking everyone for the work they do; don’t take this as though you are not appreciated. YOU ARE! It is just that many people forget to tell you. PS: Yes, I’m a high S! Lions hate you wasting their time. When I work with Dominic I have to take some time before to help ensure I am very clear on what I need. Be straight to the point. Don’t be offended if a Lion says something to you very abruptly. They probably don’t mean to be rude. They probably just have a lot on their mind! Monkeys love socialising! I do, too. So I need to be careful that Monkeys like Iggy don’t use up all my time. When you deal with Monkeys, you might find it is worth speaking and moving a bit faster; it will let them know you value them, but you are busy and need to keep moving. Turtles like Clyde love the detail, and want to be respected as an authority in their area of expertise. You can really make them feel valued by seeking out their knowledge, and letting them know that you value it. This is the home-page of IGGY the Monkey. Wow! Awesome to have you visit my home page! Come in. Now, let’s get some music on, because I want you to enjoy it here. I’d love to give you some tips on how to improve at work, but I can’t think of anything just now!!! LOL!! Hey, check us all out on this bus!!! OK, ok, Dominic just told me I HAVE to have some points on Personal Development here, so here we go! We Monkeys are great communicators. Offer to be the spokesperson for your group or team. We tend to see the positive in every situation (whereas Clyde seems to manage to find the negative in every positive!) Be prepared to be the team cheer-leader, and give everyone some encouragement. Find opportunities to hand out some praise, or to have a small celebration. Hit the sales goal? Grab a cake! Finish the budget on time? Pizza day! Take on opportunities to serve customers – make them happy! Just make sure that you don’t let your desire to be liked by everyone to take over and lose your common sense. Maybe bounce your idea around with another team member first: if it feels right to both of you, just do it. Do you have a goal? Monkeys don’t usually worry about such things, but it IS worth the time to do a career plan. Don’t let emotions carry you away. Sometimes there is a member of the staff that is getting really worked up about something, and I tend to get caught up in the excitement, and can end up on the wrong side of management. (Ooops). Make sure you don’t get caught up in things that don’t affect you. When working on a project, take the time to plan better! Another tip: try to be a bit less dependant on others from time to time. Step up to the plate, and take responsibility. What about if you’re having a bad day? You need to unwind! Grab a friend and head out for coffee or a meal. Get out and enjoy yourself! Their energy will invigorate you back to your good-old-self! PS: Yes, I’m a high I! Can’t wait to see you on my next post! Goldfish enjoy working with people, so we get on just fine. Somedays Clyde drives me crazy! He is so detail orientated! I mean, Turtles love detail. I find I have to really slow down when you speak Clyde, as well as other Turtles. They are all the same! If you are emailing a Turtle, add some extra info to the email, so they know where you are coming from. Turtles don’t just assume. Attention all business coaches and trainers! 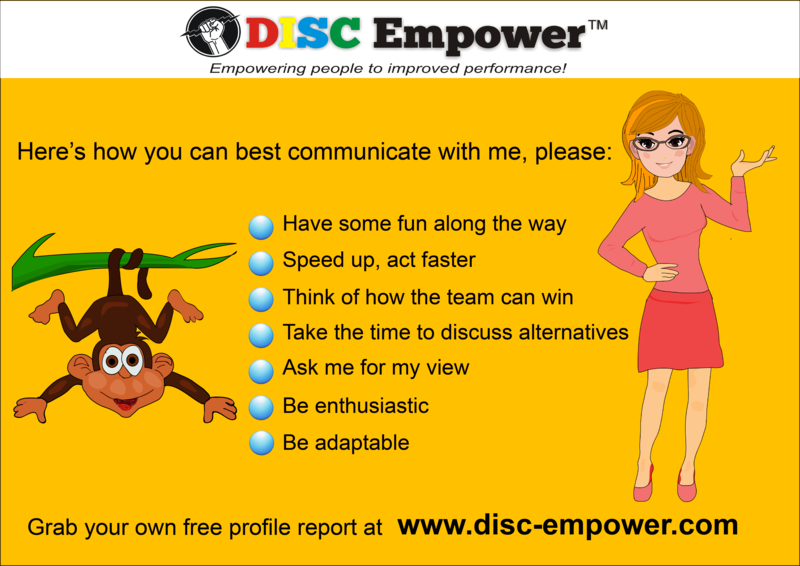 Are you in the business of helping people improve their teamwork and communication, and ultimately their results? 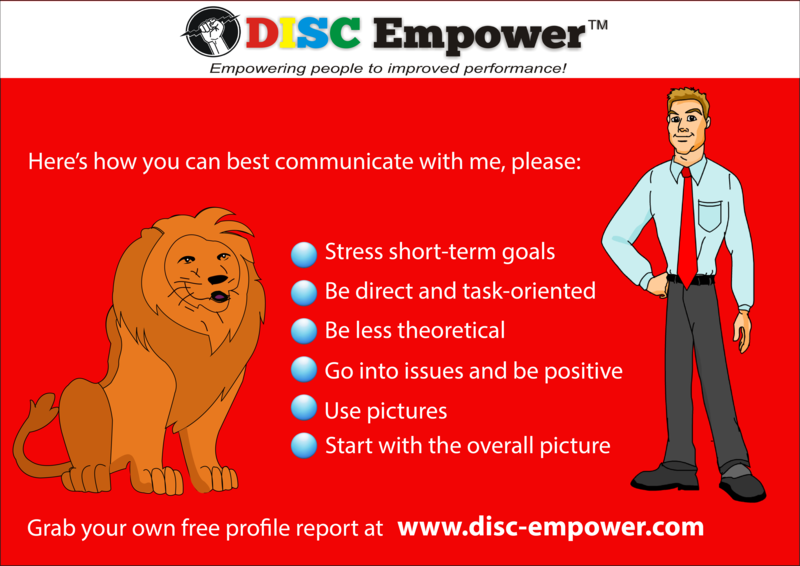 DISC Empower is a business that you find has synergies that HELP you help YOUR clients achieve their goals. If you have clients like this, and would like to gain access to the DISC Empower tools to help you coach and train your clients, please contact us now; we can’t wait to help you grow YOUR business!